The study, published in the journal Pain, looked at the effects of electro-acupuncture among 40 adults with knee osteoarthritis — the common “wear-and-tear” form of arthritis in which the cartilage cushioning the joints breaks down. Electro-acupuncture is similar to traditional acupuncture, where fine needles are inserted into specific points in the skin. What’s different is that the practitioner fits the needles with clips that are attached to a small device that delivers a continuous electrical impulse to stimulate the acupuncture point. Among the patients in the current study, those who had a daily electro-acupuncture session for 10 consecutive days reported greater improvement in their pain compared with patients who received a “sham” version of the therapy. Patients in that latter group received acupuncture, but the needles were inserted at random points on the skin rather than traditional acupuncture sites. And while the needles were attached to the electrical device, it was not actually turned on. The findings suggest that true electro-acupuncture may offer at least short-term pain relief to knee arthritis sufferers, according to the researchers, led by Dr. Sadia Ahsin of the Army Medical College Rawalpindi in Pakistan. Acupuncture has been used for more than 2,000 years in Chinese medicine to treat a wide variety of ailments. According to traditional medicine, specific acupuncture points on the skin are connected to internal pathways that conduct energy, or qi (“chee”), and stimulating these points with a fine needle promotes the healthy flow of qi. Modern research has suggested that acupuncture may help ease pain by altering signals among nerve cells or affecting the release of various chemicals of the central nervous system, such as pain-killing endorphins. In their study, Ahsin and colleagues found that electro-acupuncture appeared to raise patients’ blood levels of endorphins and lower their levels of the hormone cortisol, which tends to rise during physical or mental stress. So it’s possible that these changes explain the greater pain relief, according to the researchers. Larger, longer-term studies are still needed to see whether electro-acupuncture can have lasting benefits — and to find out how often patients would need treatment to gain those benefits. 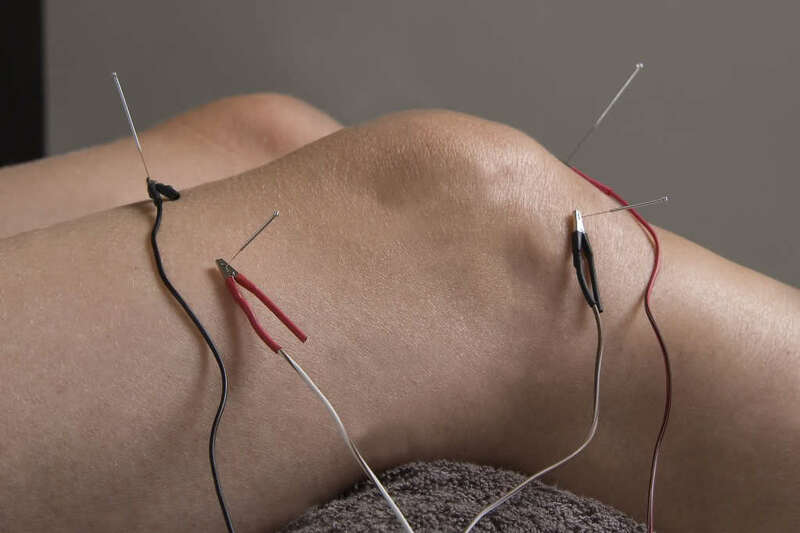 For now, Ahsin’s team writes, the current findings suggest that, for people who are interested in trying it, electro-acupuncture can be added to conventional treatment for knee arthritis. Acupuncture and electro-acupuncture are generally regarded as low-risk therapies. Among patients in this study, there were no major side effects apart from bruising at the needle site in three patients, the researchers note. SOURCE: Pain, online December 15, 2009.